Just wanted to let you know that this recipe of your breakfast dreams is sponsored by my friends at REBBL! 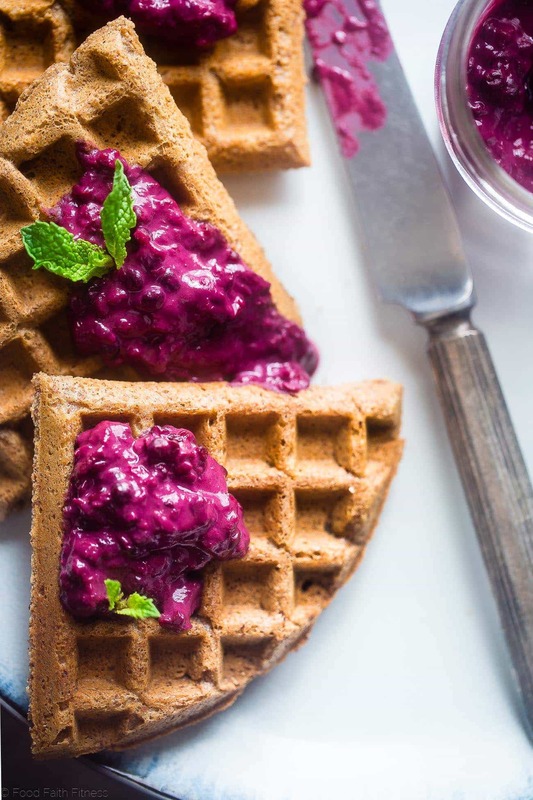 These gluten free, single serving vegan protein waffles are ready in only 10 minutes and are packed with healthy, plant-based protein! They’re a delicious addition to your morning! You have to read that like “Donkey” from “Shrek” or it’s just not as funny. Do you ever have those moments in life when you wake up and, as much as you love your usual cookie dough overnight oats or strawberry cheesecake overnight oats for breakfast, you’re JUST NOT FEELIN’ IT? Your inner-big-breakfast-loving-self is CRAVING a lazy Sunday morning filled with VAST amounts of coffee and a HYOOOGE stack of golden brown, crispy waffles to FACE PLANT INTO. But, alas, it is only Monday. Sunday was yesterday and won’t come around for a WHOLE WEEK. You’re about to spoon those wholesome flecks of not-what-you-want-right-now oatmeal into your hungry morning mouth. BUT THEN…you see this recipe. Yes, my internet friends of the universe. You CAN have waffles for breakfast on a weekday. W-H-E-N you don’t have a lot of time because that real-life-annoyance called “work” awaits you. BAM –> Waffles. Single serve. PACKED with protein and ready in, liiiiike, 10 minutes. These are kinda like the blueberry paleo protein waffles and protein paleo waffles from last year except, uhhh, TOTALLY DIFFERENT. 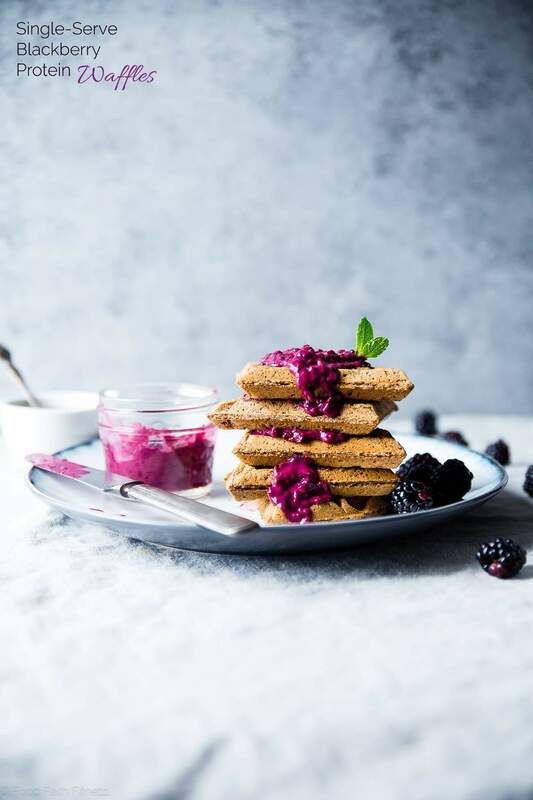 REBBL’s Vanilla Spice Protein is used as the liquid portion of the batter, which is making these waffles full of healthy, real, plant-based protein (and a ton of fiber to keep you full!) This super creamy, delicious protein drink is packing a WHOPPING 16g of protein from the perfectly-protein-powerhouse blend of organic pea, pumpkin and sunflower proteins. 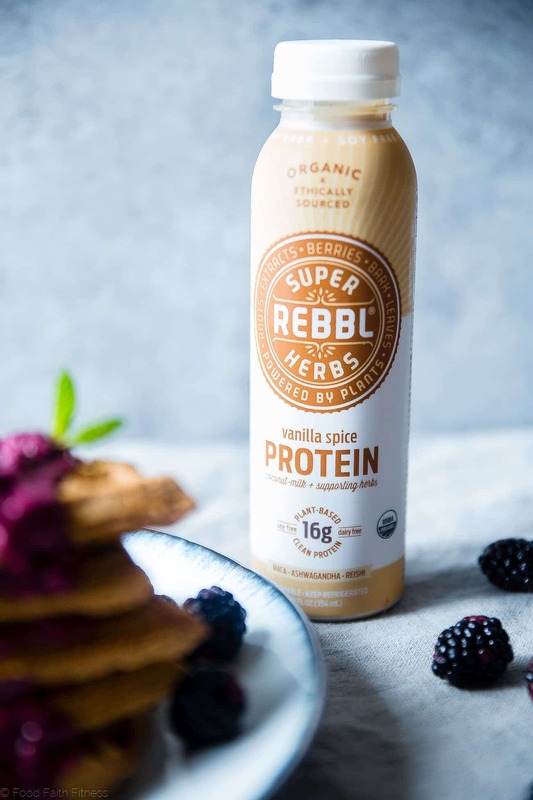 It also delivers a PUNCH of each of REBBL’s three adaptogen herbs – maca, ashwagandha and reishi mushroom -which are SUPER FAB for re-energizing and recovery. In terms of flavor, it also adds this ridiculously addictive underlying profile of creamy coconut, smooth vanilla and warm, cozy spices that mingle with the perfect touch of sweet coconut sugar. P-L-U-S the almond flour AND almond butter are adding an extra, natural 1-2 PUNCH of protein. Real food. Lots of protein. Waffles on a Monday. Alllll very good things my friends. The extra fun part is that you only use ¼ of the bottle of REBBL Protein in the waffles. WHICH MEANS you get to drink the rest on the side to compl-EAT your waffle-eating-morning-person goals in a way that can only be described as balanced, healthy, protein-packed meal BLISS. Breakfast Bliss. Tired-don’t-want-to-get-out-of-bed-you CAN have it. I need to tell you about the texture, in the sense that this little pile of only-for-you waffles is one of the CRISPIEST recipes that you will ever put in your mouth. For reals. Long gone are the days when you made almond flour waffles and they turned out SOGGY. 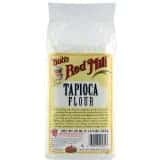 Inviting tapioca flour to the party helps absorb the moisture that the almond flour does NOT. It A-L-S-O keeps the outside of these addictive little squares MEGA crunchy, WITH insides that are SO tender and FLUFFY. 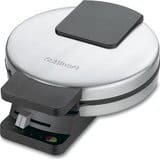 <– You can even run them through 2 cycles on the waffle iron to impart a texture so crunchy, so crispy, so DELICIOUS that I don’t even know if you can HANDLE IT. But, something tells me that YOU CAN. One of them is MORE REBBL to give a little spicy-sweet kick AND protein to the tangy blackberries. 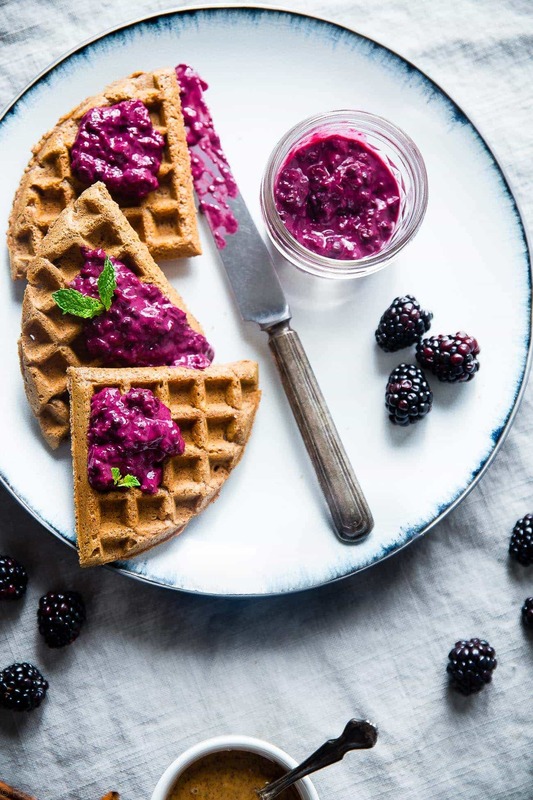 Pretty, jewel-toned purple deliciousness, dripping down the sides of the crispiest, fluffiest, get-to-eat-the-WHOLE-batch waffles equals the ULTIMATE in breakfast dreams. I HIGHLY suggest you go turn that into a reality. 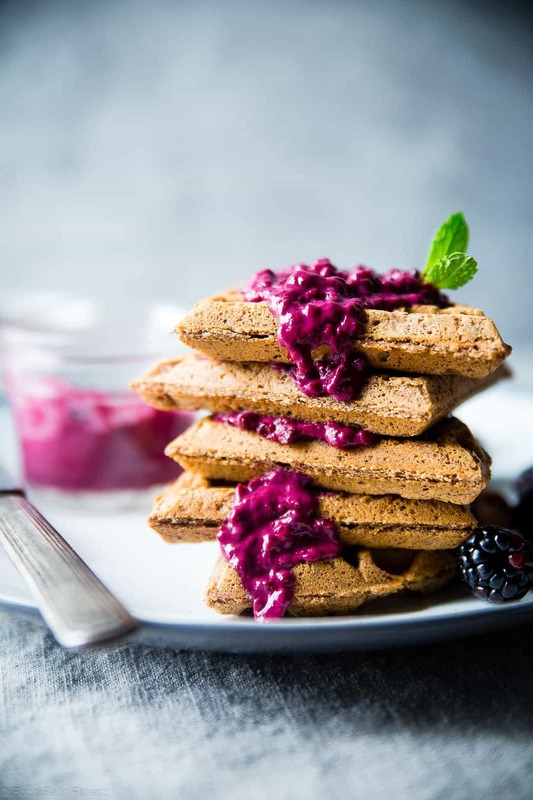 These gluten free, single serving vegan protein waffles are ready in only 10 minutes and are packed with healthy, plant-based protein! They're a delicious addition to your morning! In a small pot set over medium heat, combine the blackberries and REBBL protein. Bring to a boil. 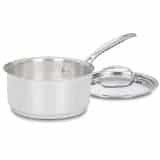 Once boiling, boil for 3 minutes, stirring frequently. 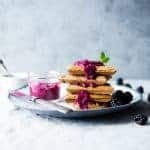 Mash the berries, leaving some a little chunky for texture and cook and additional 1-2 minutes, stirring constantly, until the mixture forms a thick sauce. 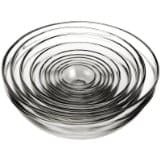 transfer to a small bowl and cover to keep warm. Rub a waffle iron with coconut oil and heat to the highest setting. In a medium bowl, stir together the almond flour, tapioca starch, coconut sugar, baking powder, cinnamon, allspice and salt. Add in the REBBL protein and almond butter and whisk until smooth. Your batter will be a little thicker than normal waffles. Drop the batter in the center of the waffle iron and spread out just a little bit (it will not fill the whole iron which is normal!) Firmly close the waffle iron and cook until crispy - I like to run the waffle through 2 cooking cycles to make it super crispy! Pour the blackberry sauce on and DEVOUR! THIS POST IS SPONSORED BY MY FRIENDS AT REBBL. THANK YOU FOR ALLOWING ME TO CONTINUE CREATING GREAT CONTENT FOR YOU BY SUPPORTING PARTNERSHIPS WITH SUPER-FAB BRANDS THAT FOOD FAITH FITNESS LOVES TO WORK WITH! AS ALWAYS, OPINIONS REMAIN 100% MY OWN! Click HERE to find out where to buy REBBL – they’re also rolling out into all Whole Foods Market Stores nationwide! These are gorgeous (and don’t look a bit soggy-are you sure they’re really gluten free? It’s almost too good to be true!). Love the blackberry sauce! These are so beautiful! Waffles are the best. Thank you – I agree! LOVE waffles! I need a giant stack of these ASAP! Oh my goodness, girl. These look fantastic. Love those fresh, plump berries with this recipe, too! In love with the color of that blackberry sauce! Wow! This sounds amazing. Plus, I am just so in love with the photos. What camera and lens are you using now? They are just so gorgeous – color, clarity…and your composition is awesome. Love it! Thank you! This is my first shoot with my brand new 24-70mm and it’s my newest favorite – just LOVE it! And still shooting on my Canon 6D!! I want to stuff my face with these! These are absolutely gorgeous! That berry sauce would make anything taste (and look) amazing! Every waffle recipe I see has me wanting to get a waffle maker… and this one is just so stunning… I might have to make an impulsive Amazon purchase. HOW DO YOU NOT HAVE ONE?! Brian. You need. I was sold as soon as I read “vegan protein.” And those toppings….such GORGEOUS colors! I can’t get over how crispy and fluffy those waffles look and the hot pink topping!! The crispiest! All about the color girlfriend! Gorgeous! And they certainly do look super crispy on the outside – just like waffles should be! Good morning! That sauce is insanely gorgeous! 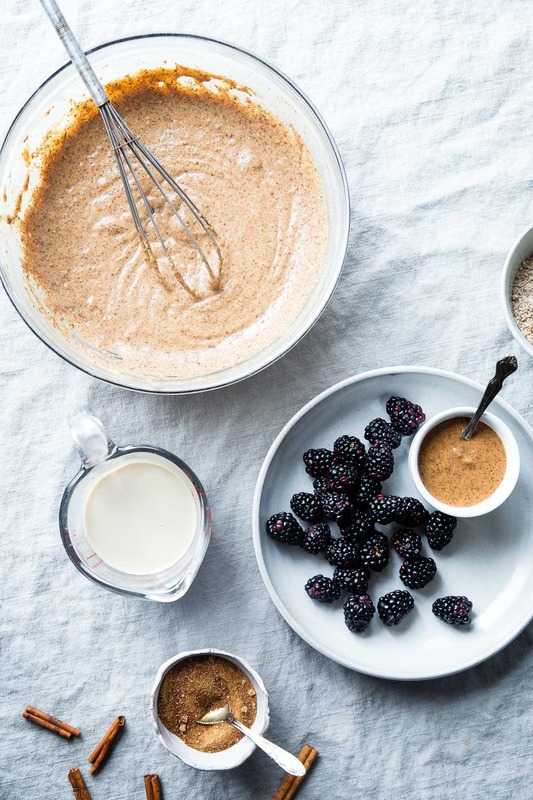 Just look at that blackberry sauce! Yum! And your photos are stunning! These look so good! Love the convenience of being able to make a single serving for myself. Pinned! Right?! The best for busy mornings! Thanks for the pin! The colors are beautiful! I’ve made waffles with the REBBL Chai but haven’t tried cooking with the protein drinks usually I just have those post barre or workout. They are so good for post workout! Try them in a post workout waffle! 😉 Thanks Sarah! Absolutely beautiful – what great pictures! Loving the fresh berries! Now isn’t that the prettiest breakfast?! These vibrant spectacular waffles will be our go to after our long run treat this Sunday. Thank you! I so hope that you love! !